One of the biggest challenges for any author is creating characters who will come to life on the page. Hopefully I have achieved that with my fictional characters, William C. (Will) Anderson, Jr., Elizabeth Hume, Wesley McRae, John Cooper, and Frank Van Dam, among others. I also chose a number of people who came to life literally and have done my best to be true to their character and the historical record. At the time of this story, Edsel would have been seventeen years old and was finishing high school at the Detroit University School. He wanted to go on to college but was strongly discouraged by his father, who didn't have much use for higher education. Instead of college, Edsel began working for the Ford Motor Company, and spent the rest of his too-short life in the service of Henry Ford, who seemed to be trying to toughen up Edsel all his life. History remembers Edsel as his father's lackey, dominated and subdued by the flinty old man. Yet Edsel could have left Ford Motor Company before the age of twenty with enough money to never work again. Instead he stayed on and became the President of the company, even then bullied by his father, who undermined Edsel's authority at every turn. Edsel had the soul--and the talent--of an artist. He designed the first Lincoln Continental, which many critics agree was the finest car design in history. He was a great supporter of the arts and was the driving force (and financier) behind bringing Diego Rivera to Detroit to paint the mural Detroit Industry, perhaps the most iconic symbol of the city, at the Detroit Institute of Arts. One incident that demonstrates his character--when the United States entered World War One, Edsel tried to enlist but was turned away because he could do more for the war effort at home than abroad. The Army offered to make him an officer and wear the Army uniform. He refused, believing it would be an affront to the brave men who were fighting. Come on, history, give the guy a break! Vito Adamo was Detroit's first recorded mob boss. He emmigrated from Sicily in 1907 and set up a grocery store in the Wyandotte area in direct competition with the Gianolla brothers. In no time at all, Vito had a stranglehold on the Detroit underworld, specializing in trafficing of illegal immigrants, beer, and liquor, as well as bookmaking and extortion schemes. Vito was an innovator. Unlike a normal Black Hand gang, whose M.O. would be to extort money from Italian business owners by promising them protection, the Adamo gang would first send in a Black Hand crew who would get their cut, and then follow it up with a "White Hand" crew that would protect them from the other guys. The same businessman would have to pay twice. It's not clear whether the Adamos or Gianollas made the first foray into illegal activities, but they were competitors and grew to hate each other. In 1911-1912 the competition between the gangs grew fierce. The Gianollas cut beer prices in order to steal business from the Adamos, who matched their prices and threw in free ice, gaining all the business back and taking away some from the Gianollas. This led to brutal retaliation and eventually to Detroit's first mob war. The newspapers tracked the story of men shot down in the streets of Little Italy. In 1913 Vito Adamo and Phillip Bucellato were tried and acquitted for the murder of Carlo Callego, a Gianolla associate. 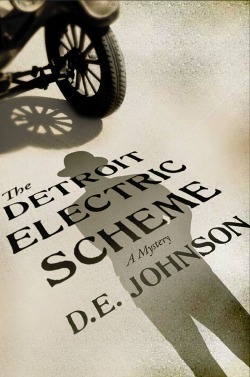 What happened next is a matter for another book (the sequel to The Detroit Electric Scheme). The Dodges don't come across as sympathetic characters in my book because, well, they weren't sympathetic characters. But they were sharp businessmen who believed in Henry Ford even when his first two automobile companies failed. They built virtually the entire Model T for a number of years, and when Ford couldn't pay their bills, agreed to take Ford stock in exchange. When they sold that stock for millions, they'd already become millionaires. However, they were mean drunks and were often featured in the Detroit newspapers for their frequent brawls and boorish behavior. John wasn't beyond using a potted plant in a restaurant as a urinal when necessity demanded. Together and separately (most often the "separately" referred to John), they pummeled their way through the saloons of Detroit. A legend of the Detroit underworld, Big Boy (real name unknown) was the 6'4", 260-pound bouncer at the Bucket, Detroit's most notorious saloon, known in the newspapers as "The Bucket of Blood" for the frequent fights, maimings, and murders on the premises. Big Boy carried a huge .44 caliber pistol and a blackjack, and reigned supreme in the toughest place in town. The Bucket was a progressive business for the turn of the century--they served black men as well as white. William Anderson (not to be confused with his fictional son, Will) was the owner of the Anderson Carriage Company, later the Anderson Electric Car Company, and later still, the Detroit Electric Company. Already a successful wagon and coach maker, he moved his family to Detroit from Port Huron in 1895 to take advantage of the larger market. (Logistics were a struggle at this time, and most manufacturers of large items were regional.) Mr. Anderson is remembered as a bluff and hearty man who often rode his horse Comet to work, regardless of the weather. He was a Mason and a member of the Detroit Athletic Club. Mr. Anderson was married and had two daughters. Henry Leland was one of the real pioneers of the automotive industry. First supplying engines to the Olds Motor Vehicle Company, Leland soon joined a group of investors to revitalize the remains of the Henry Ford Company (one of Ford's two failed car companies that preceded the Ford Motor Co.). They renamed the company Cadillac. Leland was an early adopter of using interchangeable parts, a practice that years later helped make the Ford Motor Company so successful. While Leland was at Cadillac, his friend Byron Carter was killed while starting a car for a stranded female motorist. The crank spun back and hit him in the jaw, shattering bones. Gangrene set in and he never recovered. Leland vowed to put an end to the manual (crank) starter and contracted Charles Kettering, the inventor of the electric cash register, to build a self-starter that worked. There had already been a number of self-starters available in other brands of automobiles, but they were more likely to leave a motorist stranded than to reliably start the car. Kettering changed that--and by doing so, in my opinion, single-handedly wiped out the electric car business, which had few competitive advantages at the time--self-starting being the most significant.